I wanted to try this dish since I’ve never tried a western dish before, and I never tried a noodle salad. 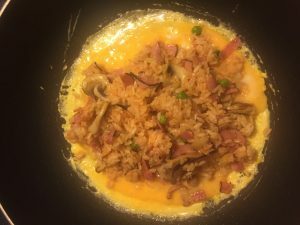 This dish seemed like a fun dish to make for friends and families. I want to make this dish since I’m a big curry fan, I enjoy eating and making curry. This is a rice curry dish, and I wanted to try making something new. 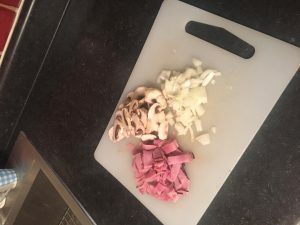 Slice mushrooms, onions, and ham into small pieces. 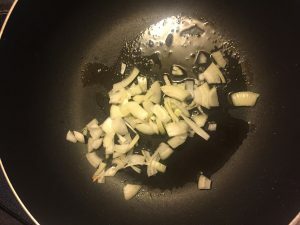 Add 15ml off oil into a frying pan and sauté the onions. 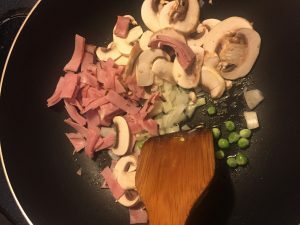 Add green peas, mushrooms, and ham, season with a pinch of salt and black pepper. 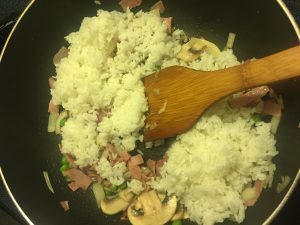 Add rice, break big chunks into small pieces. Combine well, add 15-30ml of tomato sauce (I used ketchup). Crack 2 eggs in a bowl and whisk together with 15ml of milk. Heat a frying pan over medium heat and add 15ml of butter, add beaten egg. Quickly swirl around with chopsticks. 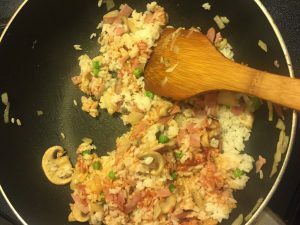 When the mixture is set but still runny, add the ketchup rice in the middle. 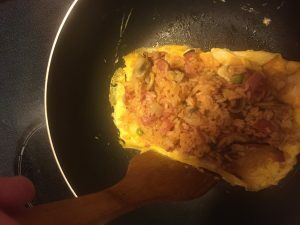 Wrap the rice both sides with egg omelette, doesn’t have to be perfect, just create an edge around the rice. 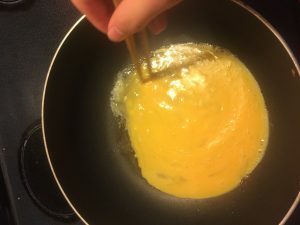 Place the serving plate and flip the pan to transfer the omurice. 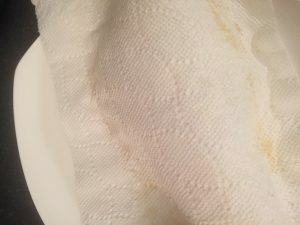 Place a piece of paper towel and gently shape the omelette into a football shape. When serving, garnish the omurice with parsley and drizzle with tomato sauce (I only used ketchup). I chose this dish because I saw a Youtube video on a chef making it. The dish looked amazing and I decided to try it out since I was told that the dish is difficult to make. It’s a western influenced Japanese dish that is popular among many. 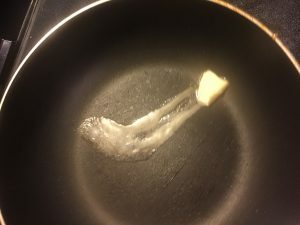 Making this dish didn’t take me too long. I halved the ingredients to make one serving, since the recipe was supposed to make two. I also replaced the tomato sauce with only ketchup, since it was late at night and I couldn’t go out to buy the missing ingredients. 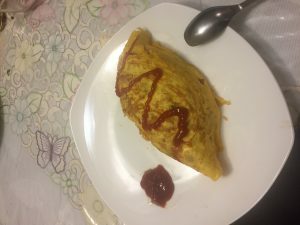 The only difficult part of making this was flipping the omurice, I felt like I tried to curl the edges too early and I was worried that the omelette might rip, but it turned out okay.